FILE - Exhaust comes from the tailpipe of a vehicle, in Salt Lake City, Utah, Jan. 3, 2019. Drivers on the U.S. East Coast may soon start paying for their climate pollution. Nine states and the District of Columbia have announced plans to introduce a system that puts a price on the carbon dioxide produced from burning gasoline and diesel fuel. As the federal government pulls back from taking action on climate change, the proposal is an example of how states and cities are aiming to move forward. Details are slim at this point, but the Transportation and Climate Initiative would likely require fuel suppliers to pay for each ton of carbon dioxide that burning their products would produce. Costs would presumably be passed on to consumers. The announcement says revenues would go toward improving transportation infrastructure and low-emissions alternatives to cars, trucks and buses. The program could raise $1.5 billion to $6 billion per year, by one estimate. "You can imagine, that could do a lot to modernize transportation infrastructure, improve mass transit, build out electric transportation options," said Fatima Ahmad at the Center for Climate and Energy Solutions, based in Washington, D.C.
Reducing traffic congestion, "which is legendary in this area," is a priority for the region's lawmakers, she added. Those investments could create an estimated 91,000 to 125,000 new jobs. Transportation is the largest source of greenhouse gas emissions in the United States. While electric utilities have cut production of carbon dioxide by switching from coal to natural gas and renewables, emissions from the transportation sector have been growing since 2012. FILE - Morning rush hour traffic makes its way along US 101 near downtown Los Angeles, California, Nov. 15, 2016. California is the only state so far that has put a price on carbon emissions from transportation fuels. The state included gas and diesel in its cap-and-trade program beginning in 2015. That program also regulates greenhouse gases from power plants and industries. For transportation fuels, wholesalers buy the permits and pass on the cost. At the current price of about $15 per ton, the program adds about 13 cents to the cost of a gallon of gas. The additional cost is less than the differences in pump price among gas stations in the same city, noted communications director Stanley Young at the California Air Resources Board, which administers the program. "When you consider the few cents that the cap and trade program adds on to [the cost at the pump], it kind-of pales," he said. The state has raised more than $9 billion from permit sales since the program began in 2012. Funds have paid for renewable energy and efficiency upgrades, mass transit, low-emissions vehicles, land preservation and other investments. To help ease the burden on low-income consumers, a third of the funds are targeted to disadvantaged communities. However, California's program has not stopped vehicle CO2 emissions from rising. After a period of decline from 2007 to 2013, greenhouse gases from vehicles have increased every year since then. The state is studying the impact of car sharing and autonomous vehicles on reducing emissions. Young said officials are also looking into land use planning, so people live closer to work or transit. "We invented sprawl," he said, "and now we're trying to deal with it." 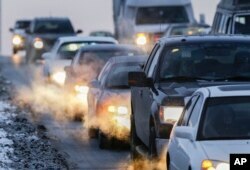 FILE - Car exhaust billows around commuter traffic in winter weather in Omaha, Nebraska, Feb. 1, 2013. 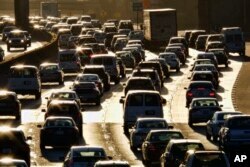 Transportation is one of the hardest sources of greenhouse gases to tackle, experts say. Unlike the next biggest source of carbon pollution, power plants, transportation emissions come from millions of individual vehicles, and the choices their owners and drivers make have a big impact on how much carbon dioxide they produce. There are essentially three ways to reduce their emissions, according to David Bookbinder at the Niskanen Center, a centrist research institution: make vehicles more efficient, reduce the amount of CO2 produced per unit of energy, or raise the price of fuel. "It's never popular to raise the price [of fuel]," Bookbinder said. Even so, "you have to really, really, really raise the price of gasoline before it has an impact on people's use." France's "yellow vest" protests are one extreme reaction to raising fuel prices. They sparked the biggest outrage where driving is least avoidable: outside city centers and in areas lacking good public transit. And they demonstrate another risk: policies that make gas more expensive can have the biggest impact on the people who can least afford it. One way to reduce the impact is by returning to consumers the money raised by pricing carbon. That's the preferred approach in a proposal by a group of Republican elder statesmen. Investing in affordable public transit is another, Bookbinder says. The members of the Transportation and Climate Initiative — Connecticut, Delaware, Maryland, Massachusetts, New Jersey, Pennsylvania, Rhode Island, Vermont, Virginia, and Washington, D.C. — will spend a year designing their individual programs. Some states can put programs in place with agency regulations. Others will have to go through their state legislatures. That will test voters' appetites to pay for their climate pollution.